Our mission is to get you the perfect ring, which is why we are dedicated to providing you with a fun, simple, and stress-free shopping environment. We are excited and proud to be your jeweler. The policies below explain the production process, lead times, and shipping procedures associated with your order. If you have any questions or concerns about shipping, please send us an email or call 1-866-215-1861. 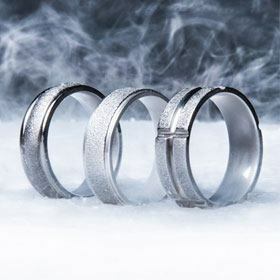 The rings at Titanium-Buzz are custom styled and made to order. When you place an order, our team members will review your ring's specs and any information you provided. Once we've processed the details, your ring will go into our production que. New orders are processed once per day. 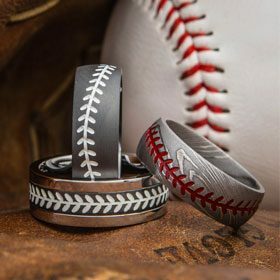 Please make sure your ring size and engraving details (if any) are accurate prior to placing your order. A production time estimate for a ring can almost always be found near the "Add to Cart" button. 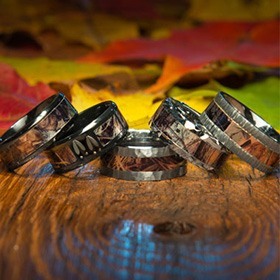 Most of our rings take between 5 and 10 business days to complete before we ship them to you. Rings with stones (diamonds, etc.) usually require about 10 business days. 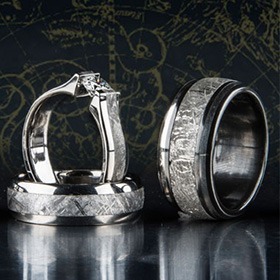 Specialized selections, like our Damascus steel rings, can take up to 15 business days. We make it our mission to meet or beat our lead times, but the production times noted on our website are just estimates and are not written in stone. Busy seasons or circumstances beyond our control may extend production by a day or two. Please note: Depending on when you place your order, we might not start processing it until the following business day. Also, ring production only occurs on business weekdays. For example, if you place an order late Friday afternoon, we won't start working on it until Monday. As noted above, all of our rings have associated lead times. If you need an item within a specific time period, it's best if you reach out to us as soon as possible to discuss rush options. We also offer 2nd Day and Overnight shipping options to help get your ring to you faster. You can select these options for an additional cost during checkout. If you have any questions about shipping, you can leave a note in the Comments section of your order, or you can contact us directly by calling 1-866-215-1861. We offer free ground shipping to all customers located in the United States, including Alaska and Hawaii. We also offer 2nd Day and Overnight shipping options to help get your ring to you as soon as possible. You can select these options during checkout. This list is subject to change without notice. All countries that we ship to will be listed as options during the checkout process. Please note: International shipments are subject to the duties, taxes, and laws of the destination country. Once your order leaves the United States, we do not have any control over the shipment. If you are located outside of the United States and have any concerns about shipping internationally, please send us an email or call us at +1-866-215-1861. If you have questions about an order or any of our policies, please call us at 1-866-215-1861. You can also send an email to service@titanium-buzz.com.